The NordicTrack U100 is packed full of features to deliver you the best possible cycling experience in both engineering and comfort. The EONS Drive system tied with silent magnetic resistance delivers a fluid, balanced spinning motion with silent resistance changes allows you to make the most from the 17 pound flywheel. The adjustable conosle angle, Fully adjustable Seating position and the large Energy-sapping cushion allows you to find a comfortable cycling position for your specific requirements. EONS Drive System - Delivers a flawless and balanced spinning motion. High Definition Display - Easy to navigate and user friendly Display Interface. Active Adjust Technology - Easily adjust console angles for any users height requirements. Safe Zone Lock - A safety lock to prevent children playing and getting injured on the bike, controlled by a passcode on the console. Energy Return Cushioning - The oversized seat absorbs energy to deliver a comfortable riding position. Fully Adjustable Seat - Adjust your seat position vertically and horizontally to easily find the perfect cycling position . 4-inch CooleAire Workout Fan - The integrated and adjustable fan housed in the console keeps you cool and refreshed. EKG Grip Pulse - Built in Heart Rate sensors help you stay in your intended heart rate zone. Transport Wheels - Easily move and store the exercise bike when not in use. 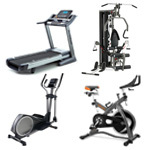 Buy NordicTrack U100 Exercise Bike from Fitness Market and save! With our efficient dispatching and quick delivery throughout Australia, NordicTrack U100 Exercise Bike can be yours sooner. Below you can rate and add reviews for NordicTrack U100 Exercise Bike.